My good friends A, J and I just came back from our Chinese New Year holiday – we had a blast and I’m so pleased that I went but I wasn’t as thrilled with Beijing as I’d expected to be.I don’t know quite what I’d expected to find, but as much as I like Beijing, I prefer the other treats that China has to offer – I certainly wouldn’t call Beijing the jewel in her crown. 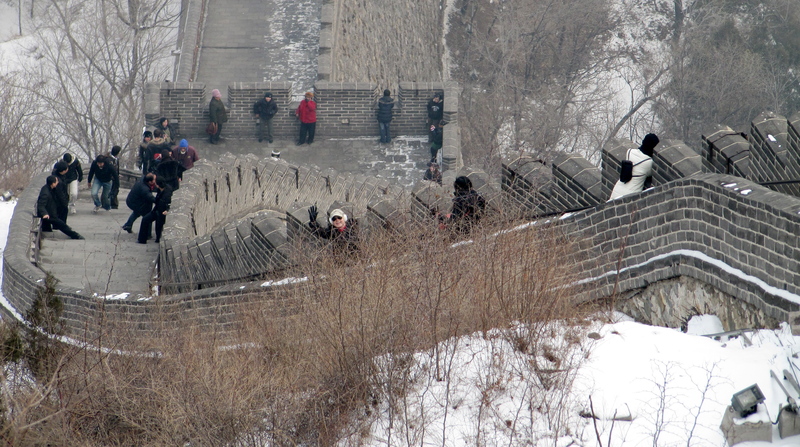 I didn’t even mention the Great Wall in my list as a) there is no one “wall”, but several pieces of fence built by different people at different times, b) the bits of wall near Beijing are all repaired and new and tourist-friendly but not original. Although it’s good for photos and a good climb but far from one of the best things I’ve seen in China. Here are some of the highs and lows we encountered.Only my humble opinion – I hope it’s helpful! So beautiful, so blue and such a fascinating history. 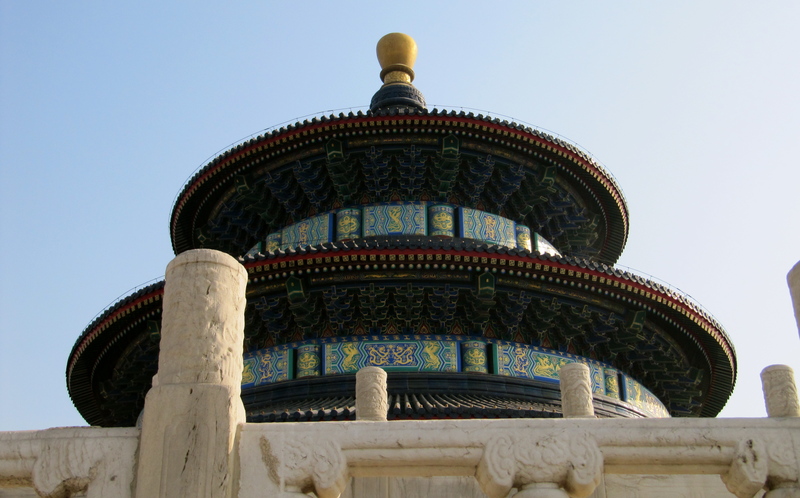 The famed Hall of Prayer for Good Harvests was first built in 1420 and has recently been restored.This is where the emperor used to go to communicate with the gods and is fitted with marble carriage ways for this purpose. The Echo Wall is great for playing Chinese whispers with a friend. Avoid the dining areas and cafes at all costs – buy a Snickers Bar, bring your own piece of fruit on hang on till the end. The souvenir and refreshment area offers a cute and silly photo opportunity for tourists – you can dress as the Emperor/Empress/Comcubine/Prince of your choice and pose on the throne or sedan chair for 30 RMB. We loved it! The site of a Mao era factory complete with communist slogans now displays local artwork. From photography to sculptures and neo-maoist propaganda art, this is a great place to hang out for a couple of hours…I could spend a whole day! The old factory bar serves high quality Italian cuisine. The community vibe is great in this place, and it’s like nowhere else in Beijing – admission is free! If you aren’t familiar with the Subway and bus service, you’ll need a taxi, which is about 40 RMB – money well spent, I say. Not as flashy as the nearby Raffles or Hilton hotels but the Crowne Plaza is a 4-star find – very comfortable rooms, reasonable rates, English speaking staff and the restaurants and bars are good value. A very welcome oasis for those of us who need a break after 6 days of $2 fried rice and noodles, delicious as they are. The cafe in the lobby serves a great club sandwich on wholemeal with fries for 80 RMB or a pasta with salad for 90 RMB. It’s a good place to chill with a hot chocolate.The proximity to Wangfujing shopping street is a big plus for me! The swanky Purple Champagne bar has a 2-for-1 happy hour from 5.30 -9pm (I’m sure… best to double check) this is definitely one of the finer bars in Beijing and a great place to start the evening. 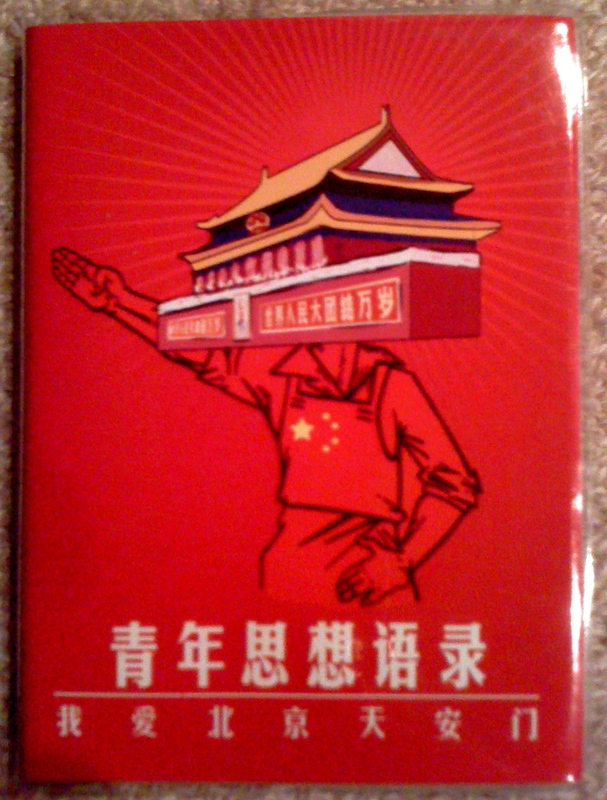 Tiananmen Square notebook – a bizarre souvenir indeed. I’ve always been a market girl, but felt a bit let down in Beijing – the Silk Market is full of cheap knockoffs and the “Arts and Crafts” items seem to all be mass produced. Wangfujing has both regular chain stores (roughly the same price as home, but we found some bargains) as well as designer stores, cheap local shops and the famous food market at night. This is the place for cheap souvenirs as the shopkeepers at the local stores are keen to negotiate, but you have to be willing to haggle or it’s not worth it. I got a better price at the silk store here than I did at the silk markets – I think it’s just called “SILK”, it’s on the main drag. As I bought several I asked for a discount, I made to walk out and was offered 30% off the marked price immediately. The Arts and Crafts Emporium is worth a look but don’t let the first few floors of overpriced junk put you off. The jewellery is nothing special and the lace and silk knickers are the same stuff as at the markets, only expensive. J and I found very reasonably priced double sided Yunnan embroidery screens starting at 70 RMB, the one I was after was 140 RMB. This is the only place we found the screens in Beijing. Lacquerware and screens are good here too, the price is higher than other places but you’re paying for quality. We managed to get lacquerware earrings for 10 RMB at the small shops and boxes for about 30 RMB. This retro restaurant and bar is one of the few places in Beijing that shows a glimpse into Beijing’s Communist past. Like it or not, Maoism is a huge part of China’s past and it’s shrouded in secrets and mystery. This company, which I believe is owned by a foreigner, offers Beijing’s only Communist tours – in Madame Mao’s own car, no less! Red Capital has a country residence near the Great Wall and a city residence in an ancient courtyard house with suites such as the “Chairman’s room” and the “Concubine’s Room”. The traditional restaurant contains relics of the Great Leap Forward and Cultural Revolution days. The bar is a 50’s style drawing room with an old phone which blasts quotes from Mao Zedong through the earpiece. Quite a find, this place. Mao’s red roasted pork is fantastic and the pots of walnut and date green tea are recommended. The wine is a bit expensive, but I think that may be the case in general in Beijing. Print a map for the driver in Chinese to avoid ending up circling Dongcheng district as we did. 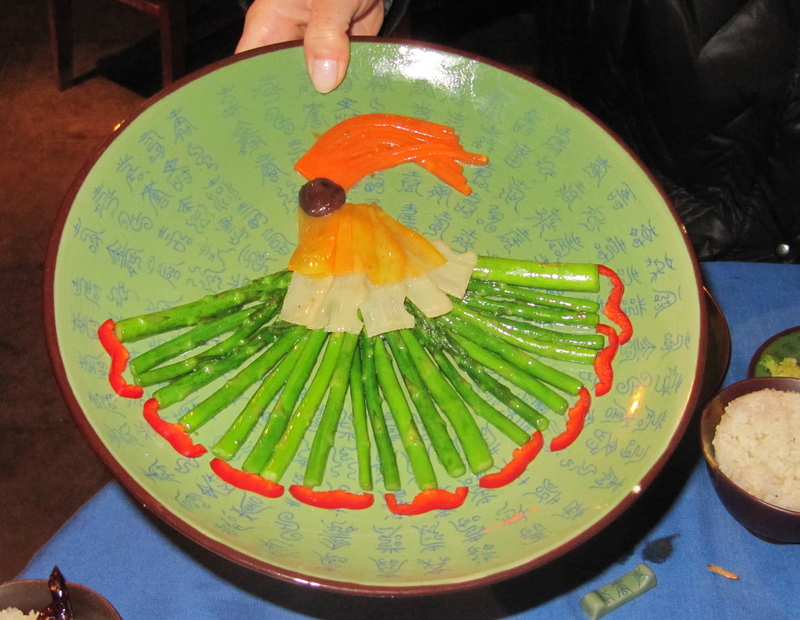 Red Capital Club’s Asparagus Fan – What a pity to eat it! Don’t bother. head to Wangfujing’s local shops or the Hongqiao Pearl Markets. Or Panjiayuan markets. Anywhere else but here, really. I did get several nice silk cushion covers for a few dollars and they seem to be good quality but the prices are SO inflated that it’s hard work to negotiate back down to a reasonable price. This is also the only market (in my experience) where vendors chased us around and harassed us for 20 minutes to buy a scarf.The sellers tend to be a bit sneakier and more dishonest than the other markets – they’ll insist for hours that the polyester blouse is pure silk. The silk pajamas that my friend bought lasted one wash before the seams went. The fake handbags are overpriced junk and the clothes are all fake Ralph Lauren. I did fancy a leather skirt, but I’ll wait till I go to Shenzhen or Hong Kong next – the clothing available there seems to be of a higher quality. Such behaviour was outlawed not only to avoid offending foreigners during the 2008 Olympics but also to reduce the risk of infection and improve living standards. Walking through puddles of slippery spittle is very unpleasant, many Beijing residents believe so too. Putting my manners and cultural sensitivity aside, I even started telling the offending phlegmy locals to use a tissue. It’s not acceptable, it’s not clean, it’s not legal and it’s just plain revolting. Well, this is the only time in my long history as a traveller that my Lonely Planet has let me down. It was pretty bad – nice canned club music, terrible live music, incompetent staff and the glasses of Chardonnay were a) dreadful and b) not a standard serving of alcohol. We had some very ordinary Champagne as well as the appalling wine and the shockingly bad live music drove us out after only 1 hour with a bill for 800 RMB. It’s too gopping to talk about.I mean, I like to try local food and beverages but – aaarrrgh! 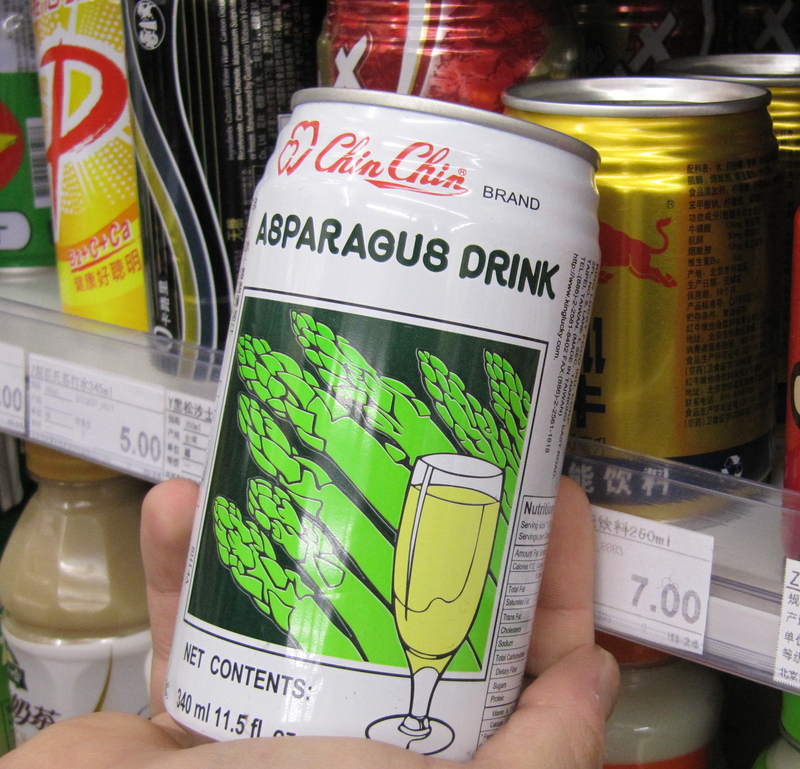 I’m retching as I write this.I think it’s something like 30% asparagus juice – so what the hell else is in it ?! Anyway, you’ll never forget your trip to Beijing – there are sometimes we just have to put up with the bizarre and unpleasant to experience what is beautiful and unique. Enjoy!